« A tragedy which could have been avoided? Will Ed Balls now apologise? The same article then lists five other places where prosecutions for similar offences have been reported or where successful prosecutions have been conducted. The five are Oxford, Derby, Rochdale, Telford and Peterborough. There may well be many other towns and cities where similar opportunist gangs continue to operate, though council officers, staff and police could now be less likely to turn a blind eye. “My role as South Yorkshire police and crime commissioner has clearly become prominent in terms of public opinion and media coverage following the publication of Professor Alexis Jay’s report. This is detracting from the important issue, which should be everybody’s focus – the 1,400 victims outlined in the report – and in providing support to victims and bringing to justice the criminals responsible for the atrocious crimes committed against them. This brings me to my reason for adding this post to a blog on home education. In all the clamour to name and shame those who failed these young people, as far as I am aware no one has discussed who at Westminster should be apologising for their failure to ensure the safety of these abused children. Now I am fully aware that national government does not have its own staff based in every town in the country, but local authorities are their “boots on the ground” in such situations. Local council members, council officers and other members of their staff are the front line in implementing central government’s so-called safeguarding policies. So if some councils have failed to safeguard children, who should carry the can at Westminster? Professor Jay’s report covers the period from 1997 to 2013 and for the majority of those years the Labour Party was in government. Tony Blair won his first general election in the year the abuse is said to have begun. Labour remained in charge until Gordon Brown lost power in May 2010. This report in the Independent cites the reference made in the recent report that an earlier one in 2002 was suppressed by Rotherham Council, and questions if this was with the knowledge of someone at the Home Office. I would not be very interested in this apart from one series of events which demanded my attention in 2009. At that time Ed Balls was the Secretary of State for Children, Schools and Families, a post he held for almost three years. 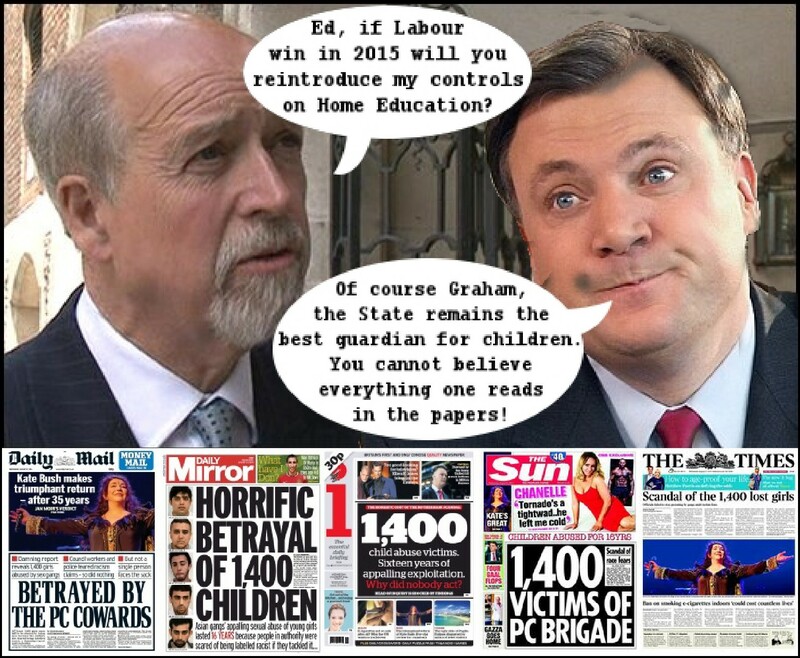 During those years Balls recruited Graham Badman to investigate home education with the view to replacing parental choice with State control. This blog is dedicated to resisting that ambition which is, it seems, part of a modern movement to disenfranchise parents. I will not repeat the history and other details here. However, I do wonder if Ed Balls or any of his predecessors are prepared to recognise that as the ministers responsible for the well-being of children, they too should be examining their own consciences? In today’s world, many politicians and educationalists believe the State is the only safe pair of hands when it comes to protecting young people. However, a steady stream of individual cases, including that of Khyra Ishaq (see here, here & here), have demonstrated that the State’s safeguarding footsoldiers, their captains and generals have hands like sieves when it comes to protecting young people! With the publication of Professor Jay’s report we now have clear evidence of repeated failures over sixteen years, but as the image below suggests I suspect some politicians will continue to chant the mantra that “parents cannot be trusted to educate their own children”. It is my personal opinion that everyone who failed these fourteen hundred young people, not only at the time of the actual abuse but also in their subsequent sufferings, needs to take responsibility for their actions – though I am not sure they all will. I also believe that those Westminster ministers who were responsible for child welfare at any stage during those sixteen years should apologise for their failures. Meaningful support should also be offered to the women who are still suffering emotionally as adults as a result of these failures. The comments which follows are not meant to distract from their needs. The title of this post is however intended to call upon Ed Balls to apologise not just to the victims of this and other abuse cases where the State/Local Authorities have failed young people under his watch, but also to the hundreds of home educating parents whom he insulted by accusing them of being potential threats to their children’s well-being. Along with others he spun his unfounded accusations that unless the State registers home educator parents, effectively vetting them, unknown numbers of children will be in great danger. Such false accusations have not gone away and are now being repeated by ill-informed State representatives who fail to justify their scaremongering – see this report for an example from the Worcester News website posted in July this year. I have reported in other posts how during and after his time as Children’s, Schools and Families Minister Balls repeatedly insisted that State hands were the safest ones to care for children. The Rotherham report serves therefore to underline what has been obvious to those with eyes to see since before the Balls & Badman attack on the integrity of home educating parents was launched. The truth is a simple one, that no matter how well they are paid, local authority employees can never possess the same attachment to the children they care for that parents have for their own offspring. Yes, there are too many cases where the parental bond breaks down and others need to step in for the children’s welfare. But Messrs Balls and Badman were not interested in imposing State supervision upon failing families alone; their target was each and every family which chooses to opt out of sending their children to school. “Out of school, out of sight and therefore out of mind” was the alarmist message championed by Ed Balls. And whilst he was feeding this poison to the media and the public at large, young girls who were “safe” in local authority care, and therefore fully in sight, were slipping out of their children’s homes in the early hours and into the back of taxis whose drivers had been paid by the council to drive them around (presumably unescorted) at other times of day! I therefore call upon the Rt. Hon. Ed Balls MP to apologise to all the home educating parents whom he has publicly undermined by implying that they could not be trusted with their own children’s welfare. This is yet another example of the State seeking to act as Thought Police imposing politically correct thinking on all children, and turning schools into its spies that challenge parents who do not go along with the world view of the political elite. Do I really expect Ed Balls to apologies for maligning home educating parents? Do I expect modern politicians to come to their senses and realise that parents have been successfully bringing up children for many centuries before the drafting of the United Nations Convention on the Rights of the Child was even thought about? Do I expect the SNP without Alex Salmond at its helm to rescind their plans for State Guardians? Regrettably, I must answer no, no and no! Which means that increasingly all parents, whether or not they home educate, need to be ever more vigilant as politicians with inflated views of the State’s safeguarding abilities seek to take over our children and squeeze their minds and personalities into moulds which ensure their compliance to whatever is deemed desirable in the future. Of course some parents may think that is a worthy course of action, but any parent who wants their children to learn how to think for themselves will see the dangers in a State system which seeks to teach children what to think rather than how to think. This entry was posted on 15/10/2014 at 3:00 pm and is filed under State Safeguarding UK. You can subscribe via RSS 2.0 feed to this post's comments. Responses are currently closed, but you can comment below, or link to this permanent URL from your own site.